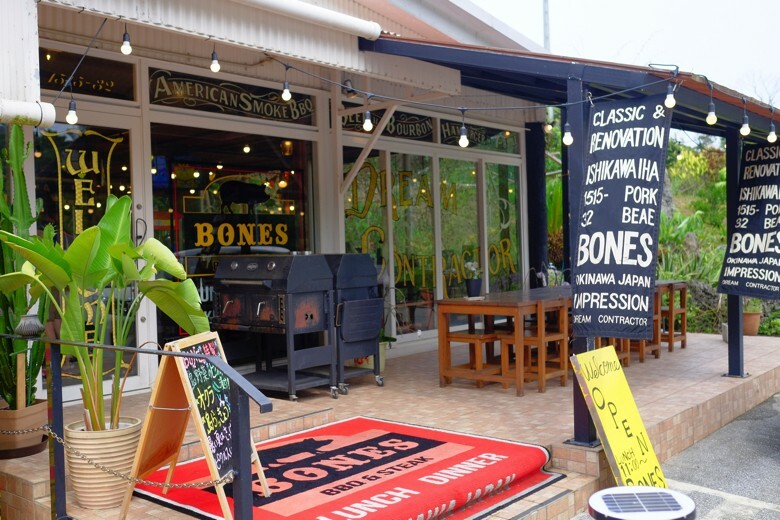 This is Bone’s in Uruma, near Ishikawa IC. It’s nested in the beautiful sub-tropical forrest park. Actually, I’ve been here before. Despite how nicely this restaurant is decorated and set up, I found the food wasn’t as good as we expected. It was the time they just opened, so I decided to let it cool off a bit and come back later. 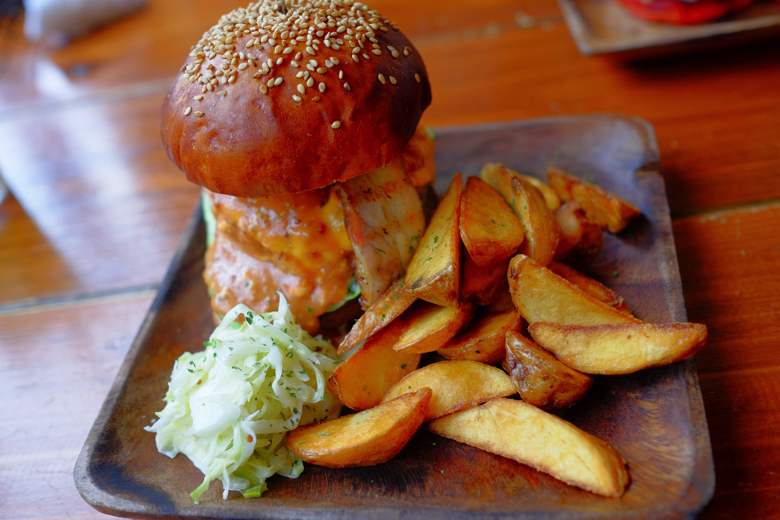 Then, this restaurant won a burger competition at Okinawa Burger Festival 2016. I also heard that they joined the competition a year before and they got all fueled up with the fact that they didn’t get any prizes. So 2016 was a dramatic comeback for them. I figured it was time to come back and see how they were doing. The place looks great. 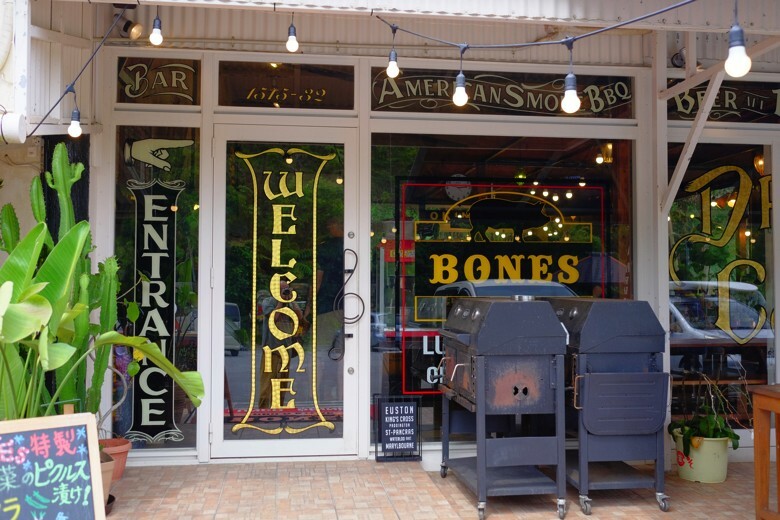 The food is American style BBQ grill and smoke. 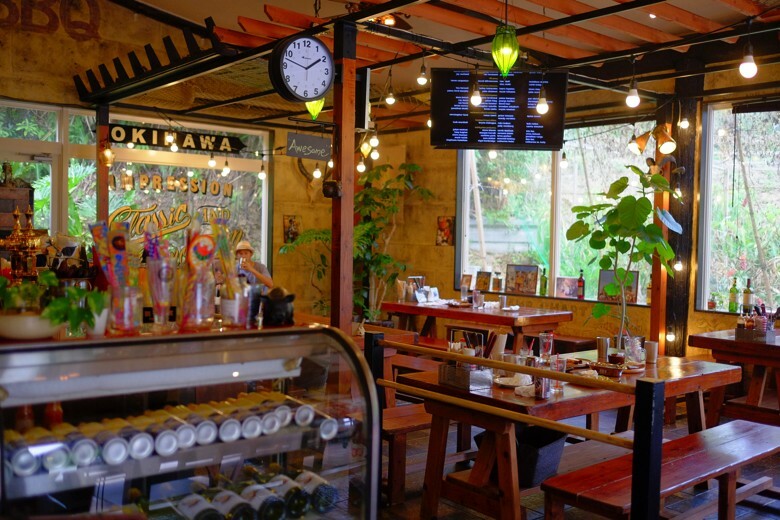 Integrated with the concept, the setup is outstanding for a Okinawa restaurant. 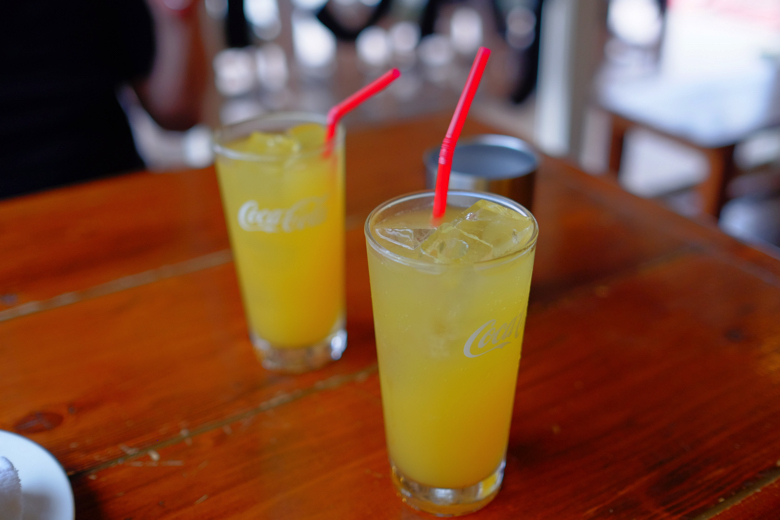 We ordered Mongo drink summer special, which was not so impressive. 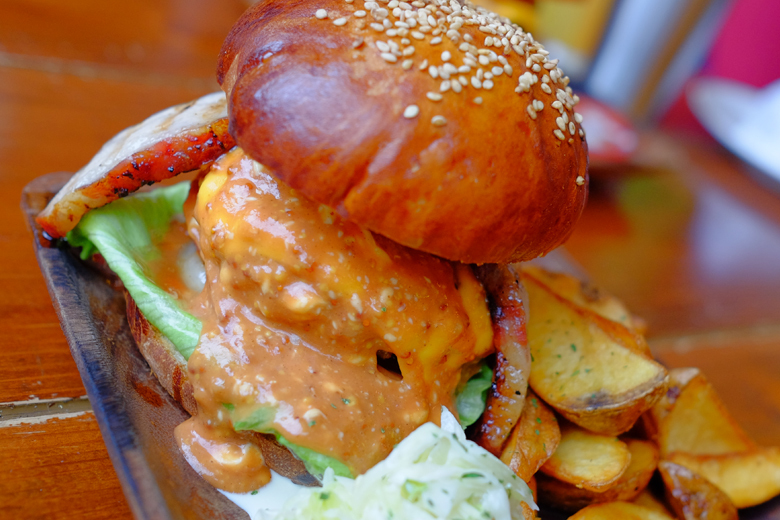 Bones Special Burger, JPY1500. The thick-cut, housemade smoky Bacon is the catch. The meaty burger pate wasn’t bad. The bacon wasn’t bad. The buns wasn’t bad. The sauce wasn’t bad. Nothing was bad. But it didn’t ring my bell somehow. I don’t know why, but it tasted like just an average as a whole. Pickles with local veggies in a cute package. But it tasted a little cowardly, too. I would like it better if it was stronger in sourness and it could be saltier too. Pickles are refresher, right? You need to kick more! Here’s the champion burger that won the competition. JPY1000. Reading off the menu… Buns are blended with carrots from famous Tsuken Island. The pork is long smoked at low temperature after marinated in Espresso coffee. Traditional unrefined sea salt from Hamahiga island. 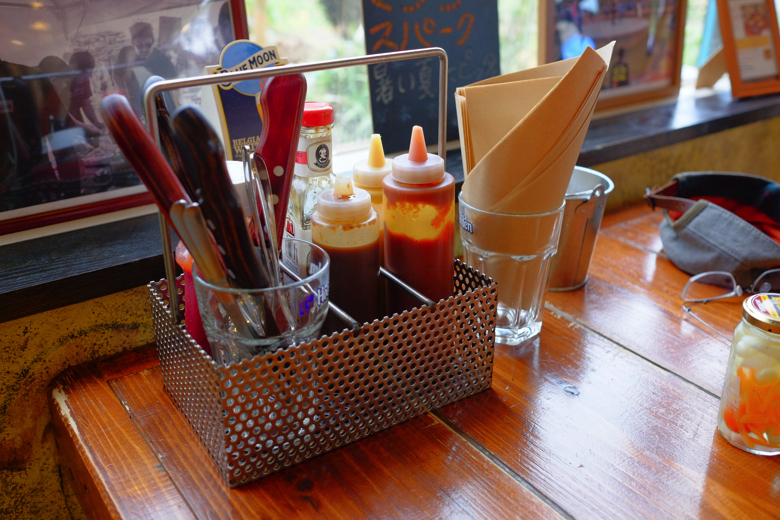 The sauce is made by the local Awamori liquor. 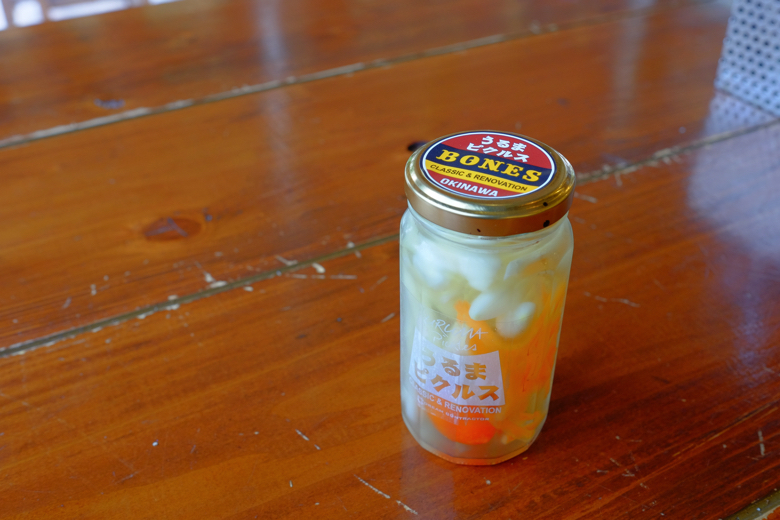 Puree of golden sweet potato, which is also Uruma city’s special product, topped with local Goya pickles. So it’s a local all-star burger. Actually, it isn’t a burger. 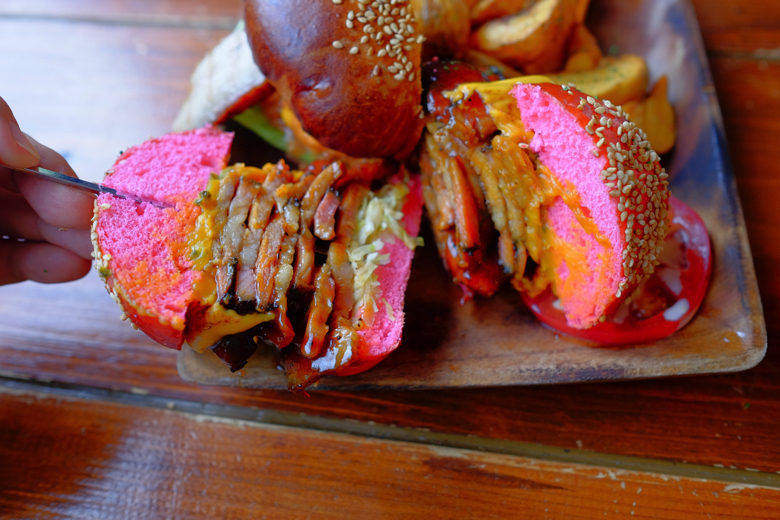 It’s a sandwich with BBQ pork slices. I believe it was pork shoulder. 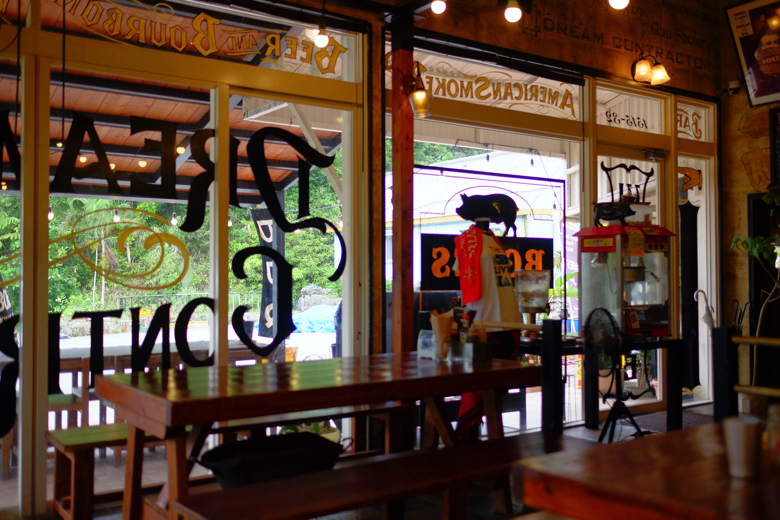 The menu explained that they smoked pork for a long time at low temperature. Indeed, the texture was like steak, rather than falling-off-the-bones kind of softness. I liked the pork slices. But then I would like it better if the buns were more crusty bread, rather than soft spongey buns. I thought the sauce tasted good, too, but they were overdoing it, I thought. I tasted nothing but the sauce. So again, all the pieces were not bad at all, but no bell is ringing for me. 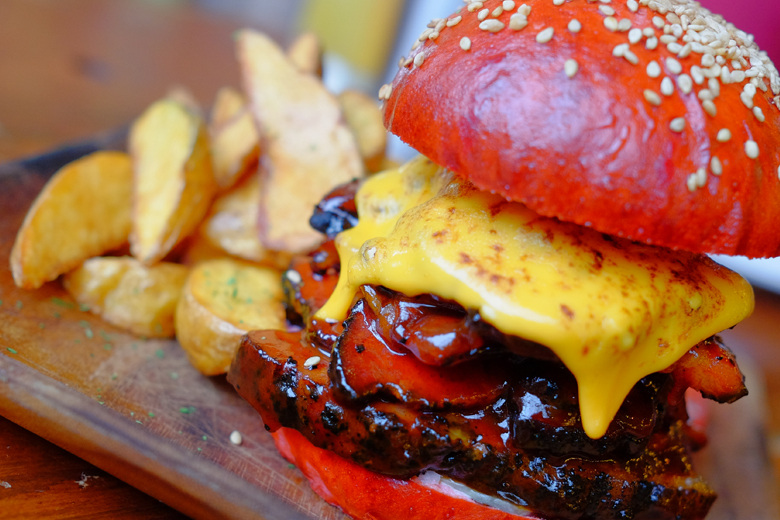 They won the competition with this burger. The concept of the competition is to make the best burger to represent local products. And this prefectural champion goes to the national championship. I think they really worked out the plan to integrate the local goodies in this burger. I just don’t think it’s integrated quite well yet. By the way, Captain Kangaroo hasn’t joined the competition. And I know there are more contenders who haven’t joined, too. But to be honest, no matter who join the competition, I know we are all far from COMPARISON with real American burgers. Every time I go to US, I get knocked down by American burgers. I think we are only high school baseball competition compared to Major League in US. I don’t usually write bad about restaurants. I simply don’t write about them. But I wanted to write about Bone’s because I really like what they are trying to achieve. They are just not there yet. And I would like to support them. Also I would like to support the burger competition too. Because, even though we are far from US Major League, these competitions will sure elevate both our restaurants and also the customers too. As I wrote about this before, I really don’t like the fact that we are submissively putting up with meat slice cultures like Yakiniku and Shabu Shabu in Japan. I think this is how it has happened. Japanese people didn’t have meat until late 19th century. The meat, especially beef, used to be luxury. The kind of meat normal people could reach was only tough meat. So slicing thin was a way to go. 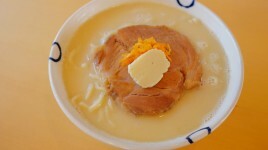 We developed food culture like Yakiniku, Shabu Shabu, and Sukiyaki, all with thin slices of meat. After the war, Japan had super economic growth and we all got rich. But we didn’t go for chunks of meat. 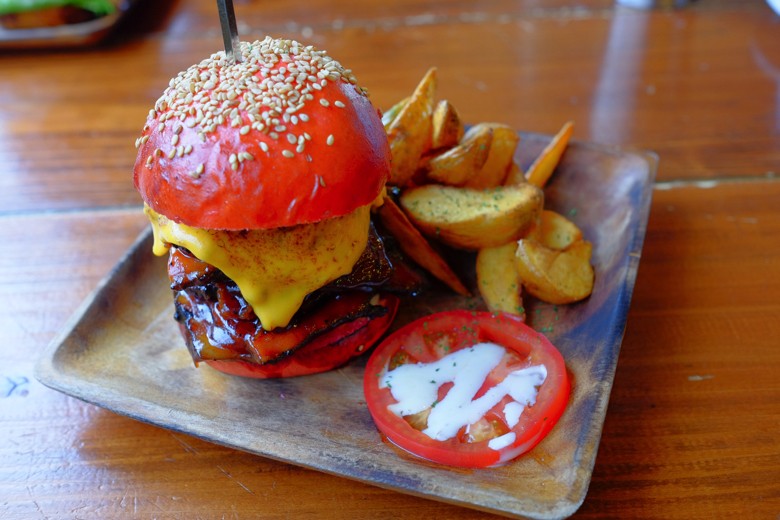 Instead, we developed Wagyu, the fatty beef that makes thin slices more savory and melting. Wagyu is not for chunks. Too fatty. 40 years ago when I was a child, beef steak was like a dream food. It was supposed to be very expensive and very delicious. 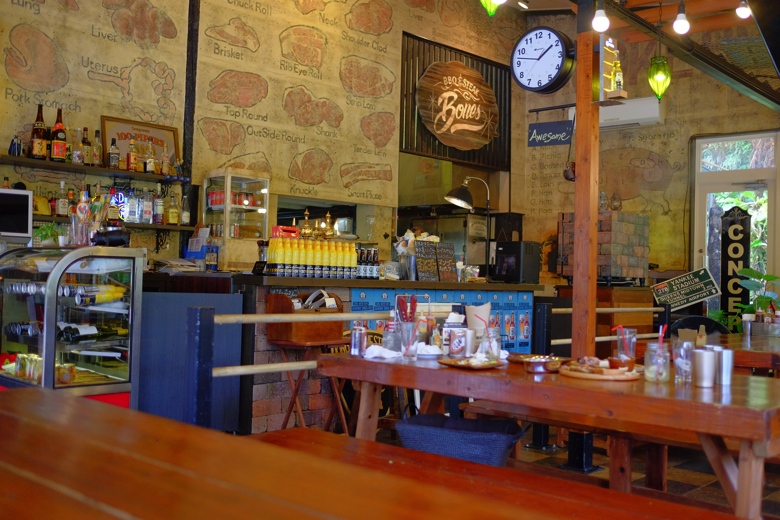 As we grow old, there are some occasions to have some steak in nice restaurants. But I don’t think it tasted so impressive for a lot of people. Maybe because Japanese chefs are not so skilled in steak or maybe because we haven’t developed the taste for chunks of red meat. Maybe both. Steaks have been ranked high in price, but not so high in popularity. You can ask around Japanese people what is their top 3 favorite foods, I bet there are almost none who claims steak or any chunks of meat. I really want that to change. It’s time to change. Change from thin slices to chunks. With thin slices, you can’t control doneness. Thin slices speed up oxidation and deterioration. There’s a clear difference between steak slices and sliced and grilled. 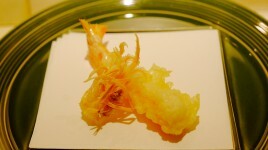 But most Japanese people have been preset that when we want meat or BBQ, thin slices is the way to have it. This is wrong. I think this is the cultural background that we haven’t been able to develop good burgers. It takes everyone, chefs, customers, suppliers, and farmers. So, as a customer, I’m supporting this restaurant and also pushing them to be better.